Here you will be knowing how to unlock an Android tablet pc using command line prompt on a general Computer PC by accessing the Android shell. 1) Android Developer Tool. ( Only one folder of Android Developer tool is required i.e. platform-tool) download the Full Android Developer tool from here (400 MB) or if you want only the platform-tools file then click here (900KB) to download. 1) Connect the tablet to your system through a USB cable. The system will automatically detect the drivers for the Tablet PC. To check if the drivers were detected, you can right click on the My Computer icon. Then click on Manage option in the appeared menu and select the option Device Manager. 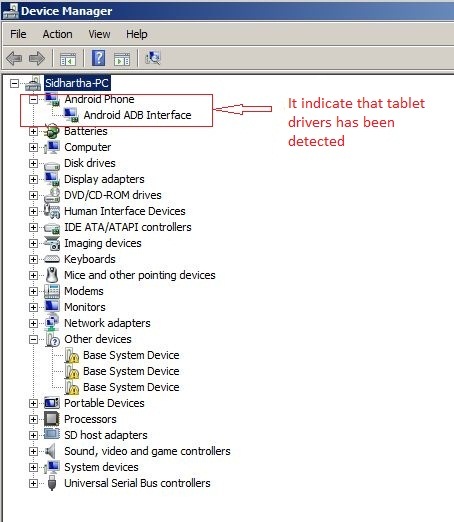 2) In case the Drivers are not detected automatically, then the sign shown below will show up in the Device manager. This means the drivers have to be installed manually. Select first option but make sure you are connected to the Internet. After clicking on the first option the drivers will be downloaded from the Internet. 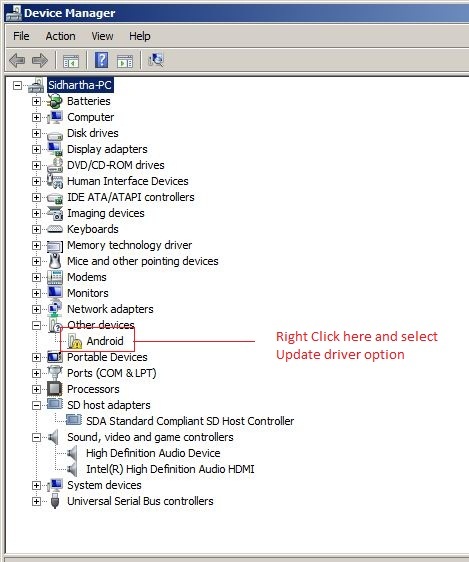 If the drivers were not installed automatically then you will have to go for the 2nd option which says “Browse My computer for drivers software“. Click on it and located the drivers folder on your computer itself. After the drivers have been installed. Open the command prompt, for that go to Run and type cmd then press Enter. When the folder ‘platform-tools’ path is brought in the command line, type the command adb shell and press Enter. Now enter the command rm /data/system/gesture.key and press enter. Thereafter, look into tablet and give any pattern sequence. Your tablet pc will get unlocked.